Our 20 students were far away from where they wanted to be, and that showed in the warm up session. All kinds of bikes and rider levels need to be sorted first, and with this the track gets cleaner and more rubber to the asphalt at the same time. 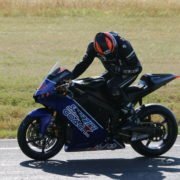 After that, we got into the classroom where it is all about body positioning, and how to do this responsibly but efficient for our goal… to drag knee. I barley couldn’t wait to tell my 30 students what surprise I would have for them… my self designed wheelie-machine! 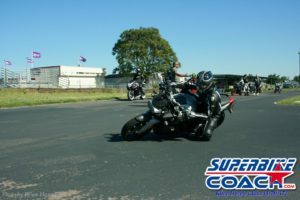 Yes… Superbike-Coach drove up some fat equipment with a goal… to make riders more successful, safer, and to make it even funner. Assistant Coach Julie Stargardter had a tough job to do, but she got rewarded every time she saw a face lighten up. 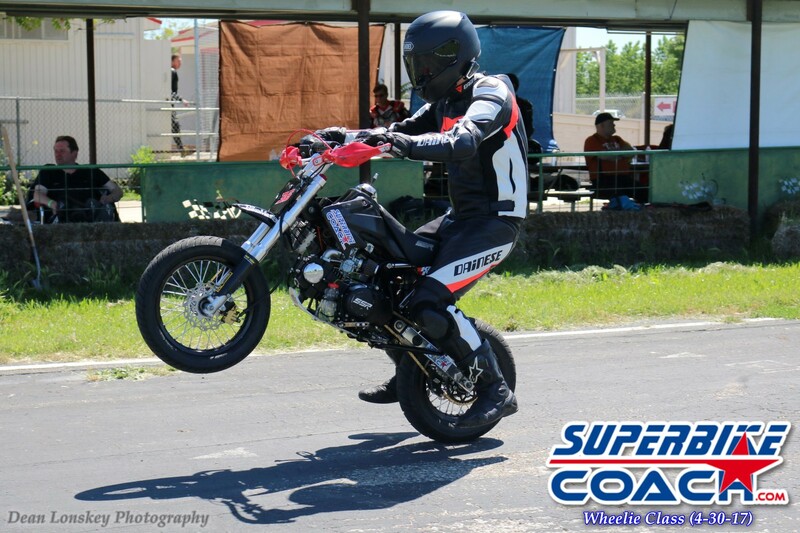 I lost my voice coaching 1on1 on the radio to students when Marion Akkaya put them on the seat of my AMA spec Supermotard with a mounted wheelie-bar which I designed (picture right, patent ongoing). Assistant Coach Brian Hunnicutt instructed them accordingly when the students applied what they’ve learned on their own bikes or our wheelie rental bike, which also has one of my wheelie bars mounted and comes with much more riding time as well. 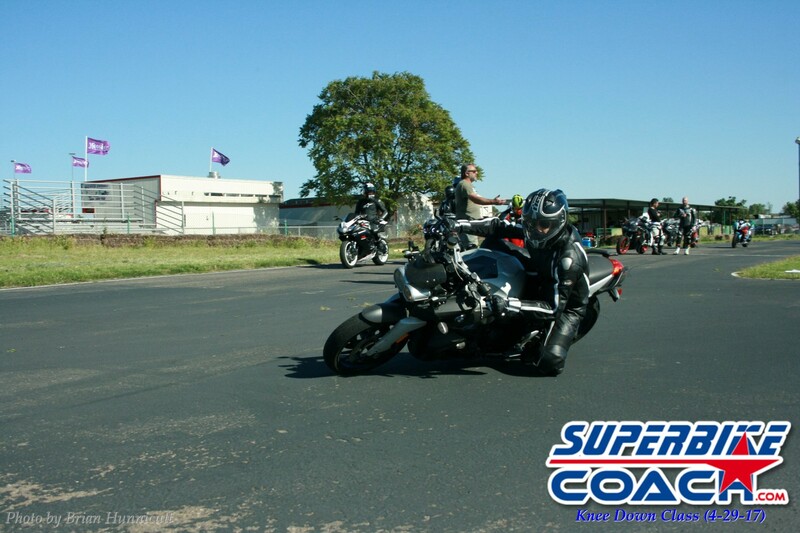 Superbike-Coach’s newest member Ben McCrae kept the groups together accordingly to their schedules and station. That’s not quite easy and always goes a little bumpy in the beginning, but he got it down pretty decent and made sure that everyone gets water and snacks we bring out. The action on our Mini-Bike couldn’t be more fun, and the way how we want our students make their wheelie attempts helps them tremendously before they are going back to their own bike- even if they don’t even realize it in the first place. 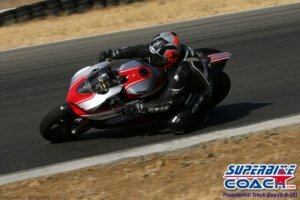 But the throttle control and timing- not to forget to break fears, is what this is all about. Our motto… if you don’t break it… you’re not trying hard enough- and we’re fine with it! Straight up… a 60% success rate and NO crashes- that shows we deliver. Yea, unfortunately not everyone makes it, but that’s the nature of ALL things in life, isn’t it? 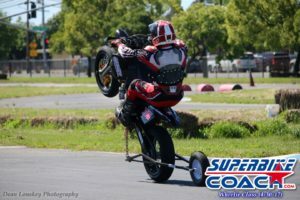 Superbike-Coach photographer Dean Lonskey was back to shoot the wheelie course, and I must say that this here is my absolute favorite shot for now (all featured pics). I guess we get to see much more like this once he has them all on the server, ready for FREE download for all students. This past Wheelie Class was certainly one of the BEST ones I’ve been a part of since I started with Coach Can, and YES, I’m a past Wheelie Class student! Coach Can explains just how to do a proper wheelie, not just a “pop up”. He’s got the perfect venue to use with 2 straights long enough to give you the confidence, he’s got the PERFECT “start-up” bike with his Superbike-coach mini-motard mini bike (perfect for practicing throttle control), he’s got the PERFECT bike to do 1-on-1 teaching with his AWESOME KTM Supermotard with a custom made wheelie bar, AND the BRAND NEW “Wheelie Machine”…the PERFECT tool to let students get the feel for what it takes to get that wheel in the air and HOLD IT….with NO FEARS of looping out! I was hooked with I took this class and I’m STILL hooked! 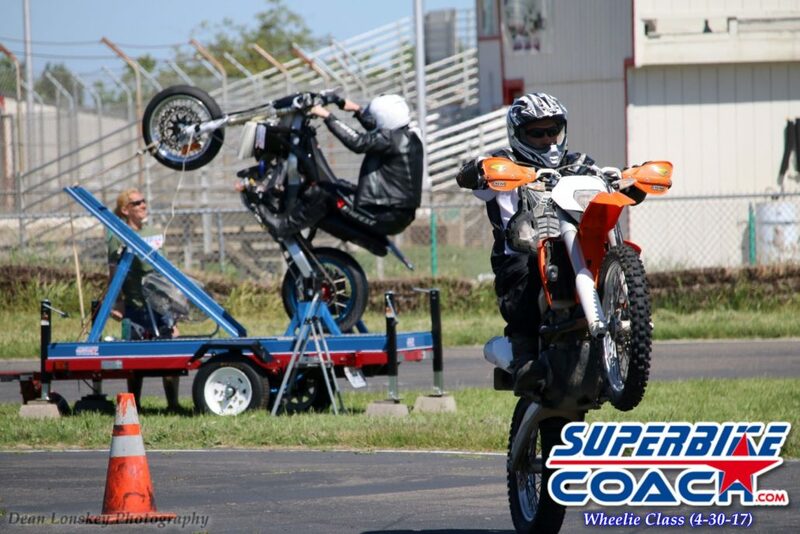 If you ever wanted to learn how to wheelie your motorcycle, sign up for this class…you’ll have a BLAST…!! !